Posted on April 26, 2011, 3:10 pm, by admin, under Recent News. This post is about two and a half weeks late. Apologies. 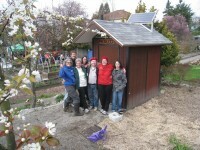 April 9th The Picardo P-Patch in Seattle, Washington hosted a gardener gathering to kick off the spring growing season. 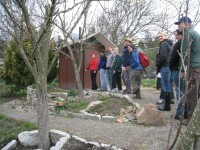 The P-Patch is a community garden where neighborhood residents keep plots. 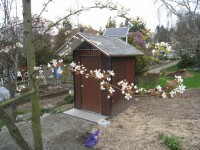 The Picaloo is a Clivus Multrum M54 Trailhead that’s available year round to gardeners. Posted on February 11, 2011, 1:21 pm, by admin, under Recent News. A recent article in the USGA Green Section Record discusses the rising use of composting toilets as on-course restrooms. 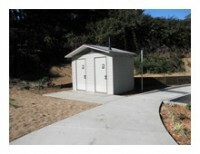 Clivus Multrum has a range of Models available for golf course restrooms. Our M54 Series is available in one or two stall units that can be custom finished and delivered pre-fabricated or as a kit. Our Foam-flush toilet provides the comfort of a conventional restroom while using only 6 ounces per visit. Posted on April 29, 2010, 8:47 am, by admin, under Recent News. The Seattle Department of Neighborhoods hosted an event in honor of the opening of the Picardo P-Patch community Garden’s new M54 Trailhead. 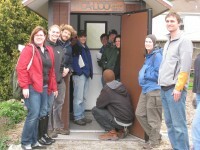 A contest was held to name the Trailhead, Pic-a-loo sounds like a winner.